In 2010, Mary Magdalene gave twenty-five extraordinary messages of spiritual instruction to author Mercedes Kirkel. 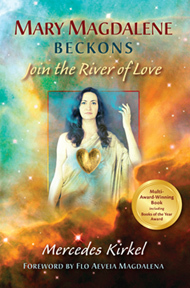 That was the birth of the multi-award winning book, MARY MAGDALENE BECKONS: Join the River of Love. While most books about Mary focus on her life in past times, Mary Magdalene Beckons presents Mary as a wellspring of contemporary wisdom and a shining example of the Sacred Feminine. Whether you’re new to Mary Magdalene’s wisdom and compassion or a longtime admirer of hers, Mary Magdalene Beckons is a gift to the heart. How did Mary Magdalene start coming to you? The short version begins in the fall of 2009, when I was living on the Big Island of Hawaii. At that time I received a message from Spirit that I was to leave the Big Island. I’d been in Hawaii for ten years and thought I would live there the rest of my life, so I checked out the message three times, just to be sure. The message remained consistent. My previous experiences of receiving messages like these had taught me that things always work out for the best when I listen to the guidance I receive. So I took a few months to close up my life and, in the spring of 2010, I left the Big Island. However, I didn’t know where I was supposed to go. I headed to the mainland and spent the next five months visiting my family and traveling to sacred sites, all the while wondering where my next home would be. In early July I was guided to Santa Fe, New Mexico, and I knew immediately this was where Spirit wanted me. Within days of arriving, I was meditating one morning when I felt a distinct, tangible presence near me. It seemed especially strong around my throat, where I clearly sensed a blockage of energy. I focused my intention on releasing whatever obstructions were keeping me from opening my throat center and allowing the energy to come through. Suddenly the voice of Mary Magdalene began to speak through me, and she proceeded to give me an amazing message about what humanity needs to do at this moment to move forward in our spiritual evolution. Mary continued to come to me daily for the next month, delivering twenty-five messages in that period of time. I recorded these messages faithfully and watched as she transmitted an entire book to me. The whole process seemed miraculous and I knew without a doubt that sharing Mary’s phenomenal wisdom with others was to be the new direction of my life. How did you know it was really Mary Magdalene? Mary communicated to me telepathically who she was as soon as she began speaking. But even as she did this, I was flooded with doubt that this could really be happening and I wasn’t just fabricating the whole thing. Mary immediately addressed my doubt as she began speaking, telling me, “I am here. Do not doubt my presence. Doubt is part of your mind. I am here to help free you from your doubting mind.” That certainly helped me to trust the experience. However, something else happened after she completed her first message that helped me even more to affirm that this was real. After receiving her communication, I was glowing with the wonder and beauty of what I’d been given. My sense of peace was short-lived, however, as a disturbing thought arose in my consciousness: I probably wouldn’t remember most of what she’d said! Without hesitating, I asked Mary to give me the message again so that I could type it into my computer. And she did just that, repeating word for word exactly what she’d expressed the first time. Whatever remaining doubt I had that she had actually communicated with me was totally dispelled by this second round of transmission. I knew that I couldn’t have done that. The other thing that verifies for me that this is Mary is how different her communications sound from the way I write. I think this is obvious to anyone who reads the book. What’s more, Mary gave me her messages in perfect form in the time it took to type them into my computer, while I labored for over a year to write all of my commentary. Why do you think Mary Magdalene chose you to communicate through? Once I got over my initial self-doubt that Mary Magdalene would ever communicate with me, I started to see how everything in my life had seemed to prepare me perfectly for receiving Mary’s messages. This included my lifetime dedication to spiritual growth and practice; my background in writing, public speaking, and teaching; and my training in areas Mary refers to as the Divine Feminine—our relationship to our body, sexuality, and emotions. Part of my “preparation” for this role of being the receiver and steward of Mary’s wisdom involved my relationship to traditional religion. I grew up in a Jewish family whose religious involvement was extremely nominal, all the while surrounded by Christianity but not really a part of it. My own interests led me to study and explore the eastern spiritual traditions of Hinduism and Buddhism, and eventually resulted in my own spiritual awakening. As a result all of this, I became aware of the various religious streams of our world, but wasn’t attached to any of them. In fact, when Mary would make a reference to a Bible passage, I would ask my friends if that was an accurate allusion, because I have never read the Bible. Each time, they confirmed her correctness. So part of what allowed me to serve her in this way was that I am both very developed in terms of my spirituality and still a relatively “blank slate” in relationship to traditional religion. What does it feel like to be in Mary Magdalene’s presence and receive her messages? Each time I connect with Mary, I feel infused with her energy, which puts me in a transformed state. I feel blissful, yet balanced and calm: my body becomes rested, my heart feels wide open, and my mind gets clear and energized. I am always thrilled to receive her exquisite, powerful messages. And I continue to be amazed at her brilliance, not only in terms of the quality of her ideas but also the way she delivers an entire message in perfect form. What was the response of your friends and family when you told them that Mary Magdalene was communicating with you? At first I was afraid to tell people that I was communicating with Mary Magdalene because I thought they wouldn’t believe me. I was quite surprised to find out that it was just the opposite. Not only did people seem to fully accept what was occurring, as soon as I would mention Mary’s name the doors to their heart seemed to fly open. I had no idea how strong people’s connection to Mary Magdalene is and how hungry people are to learn about her. During the course of receiving these messages, I was occasionally staying with my father and stepmother in Albuquerque, New Mexico. Immediately upon receiving a new communication, I would excitedly share the latest transmission with them. While they seemed to find their own depth of meaning in Mary’s words, my father in particular had a hard time with the concept of me, his daughter, receiving messages from Mary Magdalene. At one point, he suggested that we meet with a Catholic priest who is a good family friend, to ask his opinion about what was happening. How is Mary Magdalene Beckons different from other books about Mary Magdalene or about spirituality in general? Most of the books that have been written about Mary Magdalene are either historical studies or historical fiction that focus on who Mary Magdalene was, what her relationship to Jesus was, and what she did in her life 2000 years ago. In Mary Magdalene Beckons, Mary is assuming the role of teacher and she is addressing us in the present time about our present time situation and challenges. In doing so, I believe she’s continuing the work that both she and Yeshua were doing 2000 years ago. What’s fascinating to me is that besides giving us extremely valuable guidance for our growth, she also is allowing us to get to know her in a very personal and real way through her discourses. Her words communicate her embodiment of all that she speaks of, especially the Divine Feminine. You can feel it directly when you read her messages. So there’s a living transmission of her state, along with the detailed instruction she’s giving us for our lives. It’s her practical directions to us about manifesting the Divine Feminine that sets this book apart from other spiritual guides. Mary is directly linking our bodies, our sexuality, and our emotions with our spirituality in a way that’s quite different from most teachings. She’s telling us that it’s essential that we align these arenas spiritually and fulfill our growth work in each of these parts of ourselves as the foundation for opening our heart. How did you decide to include your voice along with Mary’s? As I was receiving the messages, I shared them with a few select friends. I got feedback that people really liked the messages and also didn’t fully understand some of the topics that Mary was discussing. This surprised me as everything she spoke about was crystal-clear to me. At a certain point, Mary suggested that I write a commentary to each of her messages to explain the concepts further. In contrast to her style of communication, which is extremely condensed, she wanted me to take her ideas and spread them out so as to make them easier to understand. She also wanted me to add in my personal stories, to help people see what these principles look like in real life. There seems to be a lot of focus in the book on sexuality and emotions. Why is that? Sexuality and emotions are two of the primary manifestations of the Divine Feminine in our lives, along with our relationship with our body. All three of these form the foundation for opening our heart. If any of these arenas are shut down or obstructed, this will interfere with our ability to live from the heart and thus with our spiritual growth. What does Mary have to say about sexuality? Sexuality is a doorway that opens you to union with God. For most people, sexual experiences are relatively brief, but you can learn to expand this doorway through techniques such as Tantra. . . . When you are engaging sexuality with your partner, it is profoundly bonding because of the depth you are opening yourself to and the power of the divine communion you are connecting with. It is a wondrous and beautiful sacrament to engage this with another, one of the great gifts of this realm. What does Mary recommend relative to emotions? Mary states that our emotions are intended to take us to God. Unfortunately, most of us never learned this and instead learned how to suppress our emotions or act upon them in ways that don’t support us. Mary gives concrete instruction on how to release the emotional programming that is blocking us and tells us how to relate to emotions in a way that is liberating and connects us with the Divine. Emotions are always motivated by beautiful qualities, what I would call divine aspects of ourselves. By letting ourselves fully feel and experience our emotions, we will be led to these divine aspects. Then we will be ready to act because, then, our actions will come from our higher self. Mary talks about higher dimensions. What does that mean? Most of us understand our present, physically-based reality as the third dimension. As we grow spiritually, we will literally shift into higher dimensions because our outer world is a reflection or mirror of our consciousness. Mary herself is a higher-dimensional being, and she is communicating in order to help us in the process of shifting into higher dimensions. In the book I present a map of the various dimensions, explaining their characteristics and how they all fit together. Why is there so much interest in Mary Magdalene today? For a very long time, God has primarily been represented as a Masculine God, and the Masculine has been favored over the Feminine in many ways. Mary Magdalene says that both she and Yeshua knew that it would be 2000 years before people were ready to receive her in her power as an emissary of the Divine Feminine and to start to embrace the wisdom and teaching of the Divine Feminine. Now is that time and people are interested in Mary Magdalene as never before because she is such a powerful demonstration of the Divine Feminine—as well as a powerful teacher of what that means and how we can all benefit from embracing the Feminine. What is Mary’s most important message for people? More than anything else, Mary wants to share her love for God, God’s love for us, and what we need to do to receive God’s love and live on that basis. I and so many others are calling to you to join us in the River of Love that flows from your heart. It is a place of great joy and love and peace. It is the place of connection with God, of growing in God, of being guided by God, of living in God, of living as God, of knowing all as God. I do not know of anything more wonderful than that. . . . I do this because I love you, because I know you as God. And I am not different from you. This is your destiny, too. Nevertheless, Mary is extremely practical—just like a woman! So she focuses on all the practical things we need to do to make that happen. What I love is that all the things Mary talks about are things that apply to our everyday life and that are very doable for ordinary people.